The First-ever BMW 4 Series Gran Coupe was the centre of attention at Revol Carz Makeover Workshop today and so, we nominated it the “Car of the Week!” for this blog. The BMW Grand Coupe is a strikingly handsome five-door hatchback evolved from the 3-series. With added elegance and sophistication such as frameless doors, elongated roofline and large one-piece boot, the perfect silhouette of the Gran Coupe appears more streamlined and athletic. The 4 Series Gran Coupe is powered by a 240-horsepower twin-turbo 2.0-liter four-cylinder petrol engine, with an eight-speed automatic that can propel the car from 0-100 km/h in 7.6 seconds and an electronically limited top speed of 236 km/h. Hope you will enjoy the following photos! 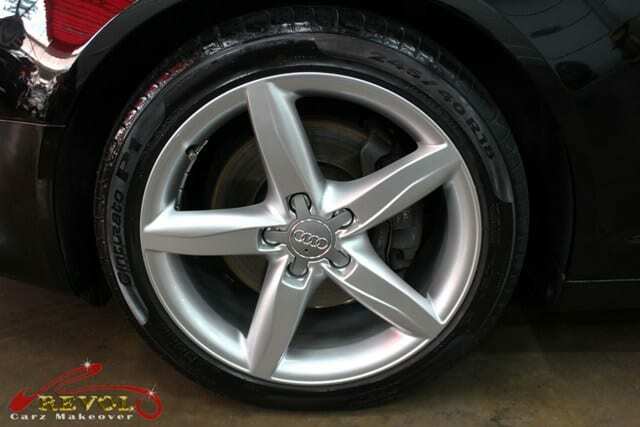 Standard 18-inch V-Spoke, Style 398 alloy wheels, exclusively designed for the BMW Gran Coupe. The First-ever 4 series Gran Coupe was one of the many BMWs to have had the ZeTough Ceramic Paint Protection. 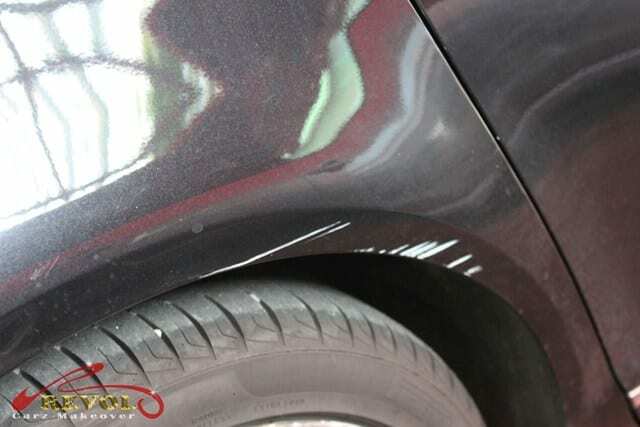 A long term protection and effortless after car maintenace is guaranteed with warranty. 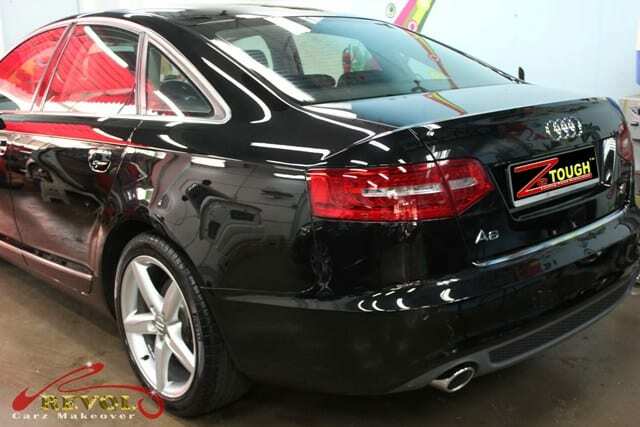 It is our pleasure to have an Audi A6 at Revol Carz Makeover for a full car respray together with ZeTough Ceramic Paint protection to revive back the showroom condition with long lasting protection too. 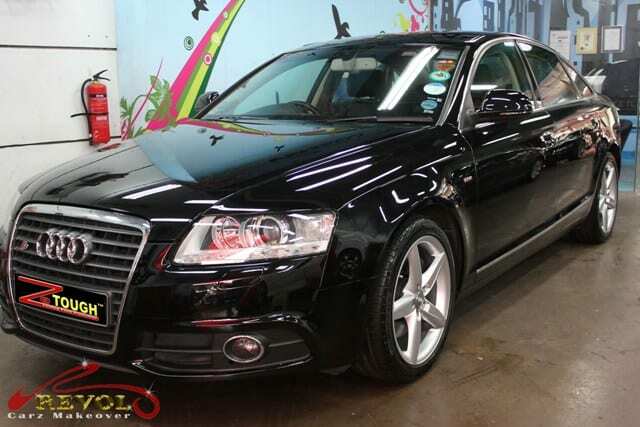 We hope you will enjoy viewing the total transformation from the before and after pictures of on this beautiful black Audi A6. 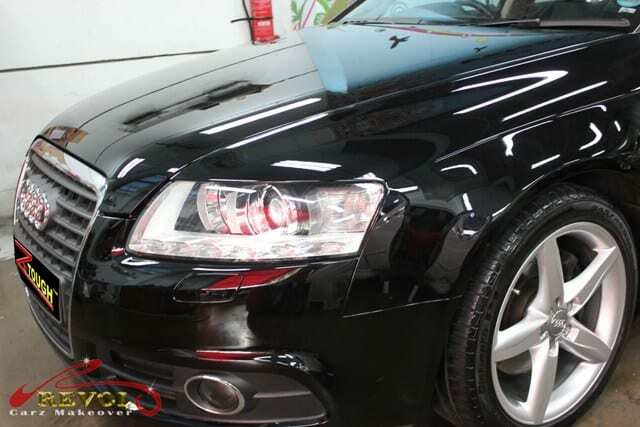 After spray painting, to enhance the shine to a complete showroom condition feeling, additional detailing, fine-polishing (to ensure no swirl marks) and interior detailing and restoration are carried out. A nicely clean up interior will enhance and complete a new car feel back! A “little” sunny lemon Citroen C4 Cactus was sitting at our Revol’s Carz Makeover workshop today and it opened the eyes of several people who came closer to inspect the quirkiest car never before seen in any vehicle. So what’s so special about it? Unusual and quirky that is. The eye-catching All-New C4 Cactus features the exclusive Airbump® panels to protect the bodyworks, “floating roof”, high-tech split headlights built into the Airbump and also, it has the world’s first “airbag-in-the-roof” creating more space in the cabin. Inside the CITREON Cactus 4 the feel is simply inviting, spacious and comfortable. Absent are the usual instrument clusters. The two intuitive digital screens controls freed up space on the slender dashboard. Wide sofa-style seats of authentic natural materials add to the stylish, relaxed ambience. The C4 is designed to run silently on battery power at low speed with a new generation 1.2-litre, 3-cylinder PureTech 82 turbo-charged petrol engine with 60kW/74 hp, torque 118Nm. CITREON factory declares the top-speed is167 km/h and 0 to 100km/h acceleration at 12.9 seconds. Inside the CITREON Cactus is spacious and comfortable. Intuitive digital controls on the two screens freed up space on the slender dashboard. Wide sofa-style seats use authentic, natural materials for stylish ambience. The quirky-looking CITREON C4 Cactus offers refreshingly fun and smooth drive. The impressive, futuristic Cactus will win you over even more with post ZeTough Ceramic Paint Protection. 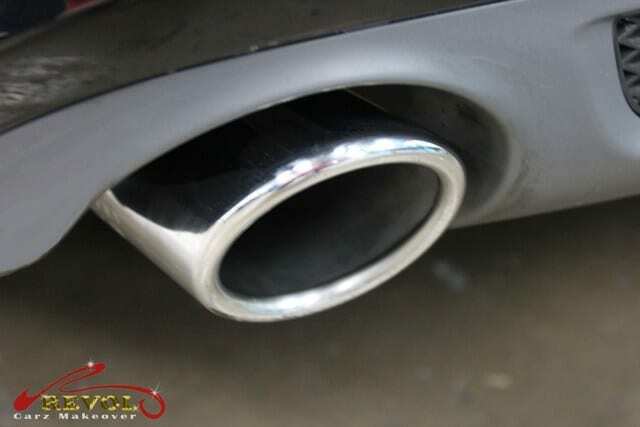 Eco-friendly ZeTough paint protection creates ceramic-like shine and guaranteed longer lasting, hard-ceramic-like paint protection that requires effortless maintenance after each treatment. Happy 50th National Day Singapore! Cheers to the 50th Years of Independence! Renault Clio IV RS brought some excitement to Revol Carz Makeover Workshop today. The Clio RS set our hearts racing to groom her ready with the essential coat of ZeTough Ceramic Paint Protection Coating. The fourth generation Clio RS (Renault Sports) is a French charm …dynamic, distinctive and well balanced five-door hot hatch with improved design spoiler, rear diffuser, twin exhausts, wheel arches and hidden rear door handles. The 2014 RS version comes with 1,618cc DIG Turbocharged 16V Nissan MR engine with 200bhp (150 kW) of power and 240Nm (at 1750 rpm) torque capable of an acceleration of 0-100km/h in 6.7 seconds and top speed of 230km/h. Renault ditched the manual transmission for the Clio RS4 in favor of the 6-speed EDC (Efficient Double Clutch) transmission. The 5-door hot hatch’s dynamic boldly styled spoiler, rear diffuser, LED daytime running lights, headlights and wheel arches improved the Clio IV RS the distinctive appearance. The RS (Renault Sport) logo under the front diamond, dramatic curves, gapping Airdam and muscular wheel-arches give Clio IV a sporty cue. The stylish headlights give the Clio RS the muscular appearance. 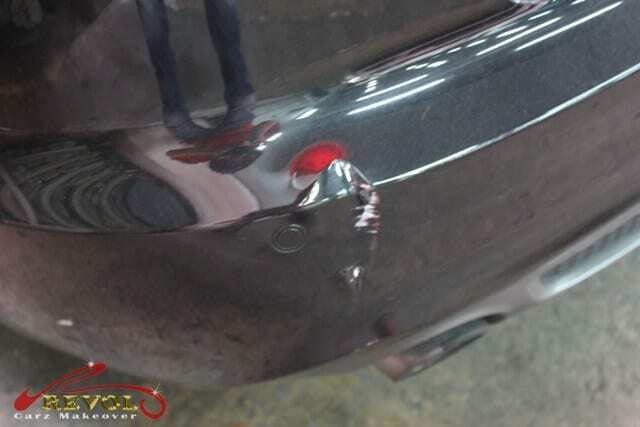 Electrically adjustable door mirrors in body color. The Clio IV roomy interior with red-satin accents on the doors, steering wheel and shifter. The steering wheel is luxuriously thick leather trimmed. Renault Sports logo inserts are on dashboard and steering wheel. 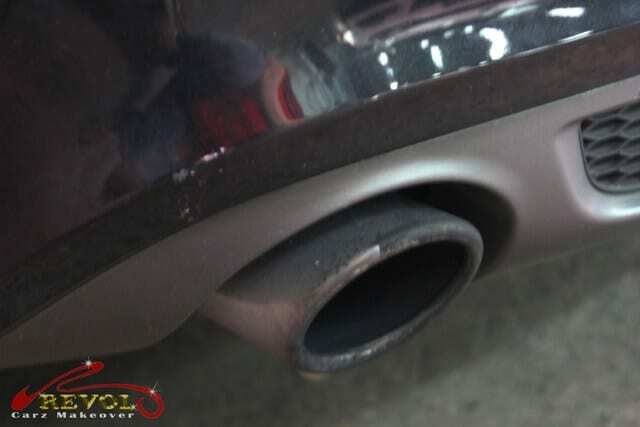 The Clio IV RS’s rear diffuser, twin rectangular chromed exhausts pipes and rear spoiler. 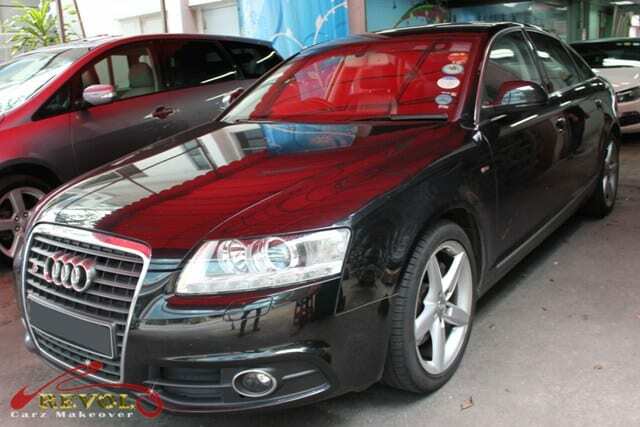 Its 300-litre boot is one of the biggest in its class. LED tail-lights, simple yet sporty. Rectangular chromed twin exhausts enhance the sporty look of the Clio IV RS. Renault Sports black alloy 17-inch wheels with red brake calipers. Revol Carz Makeover meticulous grooming standard with the treatment of ZeTough ceramic Paint Protection transformed the Renault IV RS to a long lasting lustrous finish for the Singapore SG50 national day holiday and time beyond.